Thaye Dorje, His Holiness the 17th Gyalwa Karmapa, and leader of the Karma Kagyu tradition of Tibetan Buddhism, gave the following speech on the occasion of the one year anniversary of the passing of His Holiness Kunzig Shamar Rinpoche. 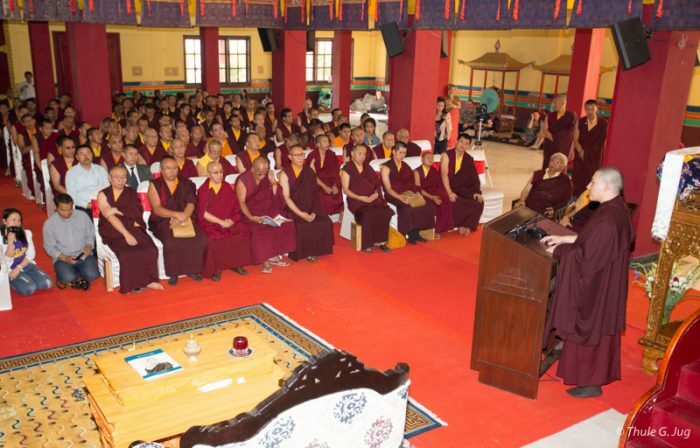 The speech was given on May 31st at the Karmapa International Buddhist Institute in New Delhi, in the presence of Venerables, monks, nuns, students, as well as dignitaries from the Bhutanese and Nepalese Embassies. Thaye Dorje, His Holiness the 17th Gyalwa Karmapa, giving the speech. May 31st marked the one year anniversary, according to the Tibetan calendar. We share this speech with you on June 11th, the date in the Western calendar when Shamar Rinpoche passed away in 2014. I would like to take this opportunity to thank everyone and offer my gratitude and appreciation to all of you for being here. I can see devotees of His Holiness Kunzig Shamar Rinpoche – many old devotees, friends and disciples, practitioners, and of course the Venerables. I would like to take a moment to remind ourselves of what this day means. It is known to us that, from a universal point of view, this day is a day to remember, and also celebrate, the life of a great being. From a spiritual point of view, this day is a day where we remind ourselves of three of the most important deeds or activities of a realised Bodhisattva: the birth, life and passing of His Holiness Kunzig Shamar Rinpoche. Just like the Buddha himself, the birth of His Holiness Kunzig Shamar Rinpoche is very important. The rebirth of a bodhisattva is supposed to be a conscious rebirth, a rebirth where the intention is to benefit sentient beings, and it is through that intent that they take the rebirth. And so we must utilise this day and take time to remember this. Secondly, we try to remember his life, his activity, his legacy, the contribution that has been made to the world. Just like many great beings that we know throughout history, and in our present day, the life of His Holiness Kunzig Shamar Rinpoche has been a tremendous source of inspiration for all of us. We remember his ability and determination to protect and preserve the very lineage that we know. This, of course, is not just any lineage, but a lineage of compassion and wisdom: a lineage for the teachings of Lord Buddha; the teachings that have survived; the teachings that have developed for over 2500 years; and are developing as we speak. These teachings have been brought to the various regions of the world. Buddhist teachings have now reached everywhere across the globe, and are benefiting countless beings through a message of compassion and wisdom. Countless beings are realising the benefit of such timeless teachings, of such timeless practice, a practice that doesn’t require any effort at all. Simply by generating compassion, generating wisdom to others, brings great peace to ourselves, to others, and therefore to all those around us. And this effect, of course, is timeless. The benefit of these teachings has been seen by the Buddha, it has been seen by the Bodhisattvas – Bodhisattvas being those who follow the way to become Buddhas – so they have seen it, they have experienced it, they have realised it. And so it is with the great being we are talking about today – His Holiness Kunzig Shamar Rinpoche. The legacy that he has left is highlighted in the practitioners that are here, and those who are not – the practitioners who commit their time and energy to further develop an understanding of what we can achieve, how much we can contribute to others, how we can develop compassion and wisdom. Because of His Holiness Kunzig Shamar Rinpoche’s efforts to preserve this lineage, we are able to share in it, we are able to practice it, we are able to live with it. We are able to somehow integrate our lineage into our busy daily lives, and find real meaning. The teachings he preserved are so important in these materialistic and challenging times. Buddhist teachings are extremely difficult to preserve, mainly, as Buddha said, due to our emotions. Of course, the karma factor comes into play. Karma is a very strong force, a very powerful force that drives us to various limits. But by trying to understand the challenges of karma and the afflictive emotions that we face every day, we actually come to understand how beneficial this practice of compassion and wisdom is. Compassion and wisdom is the antidote to the karma and afflictive emotions we face, and so we are grateful to His Holiness Kunzig Shamar Rinpoche for preserving these precious teachings. Therefore, we have to remember what he has left for us: the timeless and precious Buddha dharma, and the understanding that we have for one another. So this is what we have to remember, and we have to make use of this opportunity. As Venerable Jigme Rinpoche previously mentioned, the precious human body gives us a precious opportunity to benefit others. At the same time it is fragile because of the karmas and afflictive emotions that are present. I invite all of you to take this opportunity to reflect on the meaning of compassion and wisdom, and the benefits of embracing these qualities. And by doing so, you will come to understand the true benefit of having the presence of great beings, great Bodhisattvas in our lives like His Holiness Kunzig Shamar Rinpoche, because without them these teachings have simply no way to survive, they have no way to flourish. It is due to these Bodhisattvas’ activities, and their lives, and their dedication, that these teachings have been preserved and shared, and made available for all of us. If we experience any kind of peace, a sense of peace, be it physically, mentally, in any way, whatever the amount, whatever the magnitude, whatever we experience, any form of peace – it’s all due to none other than the practice of compassion and wisdom. So therefore, this is something very important for us all to remember. Thirdly, just like the Buddha, the third most important deed or activity is that of the Parinirvana or, in simple terms, passing away. His Holiness Kunzig Shamar Rinpoche’s final teaching was that of impermanence – how fragile, how constantly changeable our life is. So even though we may perceive this in a very mundane way, in a very worldly way – that such events are just a part of life and nothing more. But in fact the Parinirvana is something more than that. It should be perceived, it should be understood, as a direct teaching. When such things occur, immediately it makes us contemplate and wonder about one’s own being, one’s own state: that if such a great being is able to pass away, then how about oneself? How about others? And so therefore, it immediately brings not only curiosity, but a moment of deep reflection. It is difficult to digest such teachings when someone passes away. It could happen to someone very close to you, someone who’s very influential to you – and when that happens, it can be very daunting, emotional and heavy. Nevertheless, there’s something to learn from their passing. And in the case of the passing of His Holiness Kunzig Shamar Rinpoche, there is a teaching: to remind ourselves how fragile and impermanent our life is. Therefore, I ask you to absorb the experiences you have, and not to let go of them and somehow be taken over by your daily tasks and lives. Because there is great wisdom in these moments: remembering the impermanence of every aspect of life, every change of one’s own way of thinking, one’s own way of being, one’s own way of behaving, and so on. So by focusing on this final teaching of His Holiness Kunzig Shamar Rinpoche, it gives us greater wisdom. This wisdom is not something that is gained from somewhere out there, but is experienced from within. Try and focus on it, over and over again (which is called a practice, of course), and for this of course you need to give yourself time, be a bit more consistent in a way, meaning that you give time for this experience, for this wisdom, for this understanding to grow. By doing this, the teaching becomes something timeless, it becomes something limitless in a way. Timeless meaning that it doesn’t get exhausted. Whereas in a materialistic aspect, after some time it has its own limit and end, in this case, if we focus on the qualities of compassion and wisdom that we possess – it’s truly timeless. So therefore, I think it’s crucial for all of us to utilise this moment, this precious moment that has been given to us. And of course, today is a very special occasion because it marks the first anniversary of the Parinirvana of His Holiness Kunzig Shamar Rinpoche, and for this occasion we are fortunate enough to have the bone relics, which is very special. For most of us it may be difficult to comprehend the significance of the bone relics. The bone relics are one of the many signs or proofs that a being is a great being. ‘Great being’ does not mean that someone is born as a great being, of course. The Buddha himself, like all of us, began from an ordinary state of life or circumstances, and this is also true of His Holiness Kunzig Shamar Rinpoche. But over time, due to his sheer quality and dedication, he excelled and transcended in his qualities of compassion and wisdom. For great beings, not only does their true essence, which is their consciousness, develop from an emotional state into an enlightened state, but their physical state is affected – in a positive way, of course. When consciousness departs from this world, the physical body also leaves marks reflecting that the consciousness has compassion and wisdom. So as a sign, often there are remains following the cremation. Normally, when we cremate a body, we all know that of course in the end the fire consumes everything – nothing can remain there. But because of the great beings’ understanding and abilities, actually remains are left. And it is said that when the remains are left it means that the followers, disciples or practitioners have a positive karmic connection with the being who has passed away. And due to that, as a source of receiving blessing and inspiration, the remains are left. And so it is in the case of His Holiness Kunzig Shamar Rinpoche. Sometimes, remains such as the eye faculty or the tongue faculty are left, due to the activity of that very being. If a heart remains, it means that the being has practised Bodhicitta. If a tongue is left behind, it means that the being has practiced pure speech. If the eyeballs are left behind, it means that the individual has practiced on the visualisation of pure view. The various remains that are left, with the relics of course (which come in various forms), represent a source of blessing. And so therefore, I think that we are all very fortunate to have the remains, to actually gain blessing from them. And so therefore, a part of the relics has now been installed here, in this very temple, and so we should all take blessing and offer prayers. Unlike the way in which we might celebrate in a universal way someone who has passed away, in a spiritual aspect, especially for the passing of a great being like His Holiness Kunzig Shamar Rinpoche, actually it’s not just a way to remember the person, but more than that: to call for their blessing; to call for their inspiration; to call for their wisdom; to call for their understanding. By doing so, then there is there is something else that is timeless that we can absorb, and this is very beneficial. So therefore, I’m glad that many of us are here. I know that there are many others that were not able to come, due to the tragedies that have occurred in the region of Nepal, as well as for other reasons, and so therefore, of course they are not able to be here today. However, I appreciate and rejoice in the fact that those of us who are here utilise this precious moment. In this moment, let us remember an important fact about His Holiness Kunzig Shamar Rinpoche: that he is a reincarnated being. This is very significant – a tradition that began back in Tibet, within Buddhism of course, within Tibetan Buddhism. A tradition where: in order to benefit sentient beings; to continue the lineage that has been brought from this land, this nation, your nation here in India; the teachings that were brought all the way over the Himalayas to Tibet, and all over the world; to preserve this tradition, the great being reincarnates over and over again. 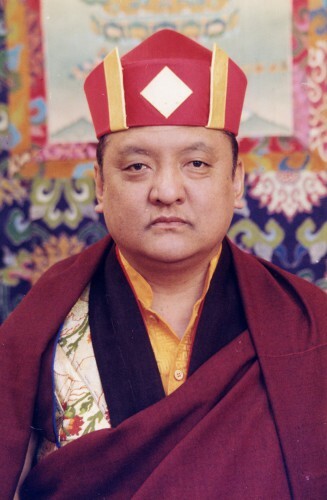 As we know, the remains of this Kunzig Shamar Rinpoche are that of the 14th reincarnation. And so therefore, we should also utilise this moment to pray from the bottom or our hearts for the swift return of the 15th reincarnation. I would like to ask all of you to join me in this prayer, which will also last, starting from tomorrow, for over a week, with the practice of what is known as Chakrasamvara, and which is a tradition and practice that we have kept for centuries. And all of you are most welcome to join, but at the same time today is equally a very special day, and therefore I would like to ask you to pray and to receive the blessings from the relics. Finally, I would like to offer my gratitude to all those who have come. You all have busy schedules, hectic lives and so on, but nevertheless you took the time to come here. So we have Venerables, monks and nuns who have come here, devotees, of course old acquaintances of His Holiness Kunzig Shamar Rinpoche, as well as representatives from both the Bhutanese and Nepalese Embassies. I very much appreciate your coming as well. Not only that, we have students from all over the world, and I am really grateful because I know how hard it is for all of you to take the time to come here. So thank you so much, and may we all benefit sentient beings, and may we all generate compassion and wisdom.